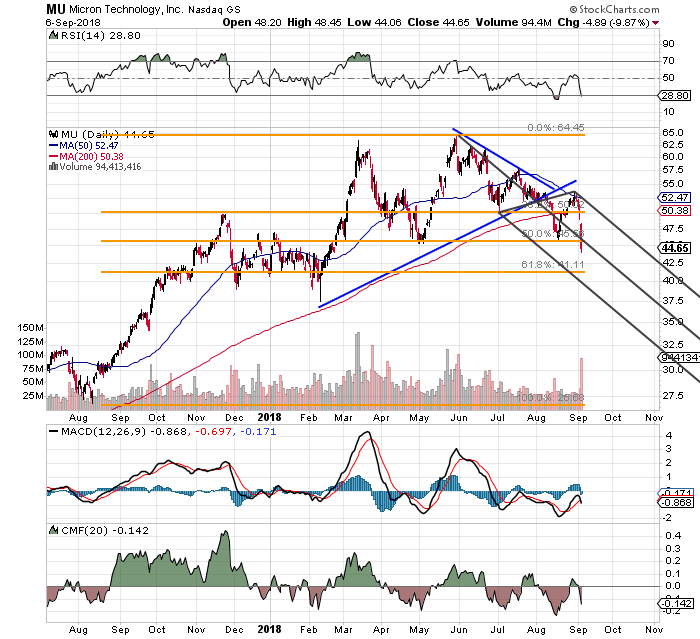 The Philadelphia Semiconductor Index gave up 2.7% on Thursday, while Micron Technology (MU - Get Report) tumbled by nearly 10%. What gives, and how should you play Micron here? Well, Micron reports fiscal-fourth-quarter results on Sept. 20, and word is that industry expectations are still for 20% growth in shipments for the year. I'm long Micron, and I even added shares over the past two days using the proceeds from liquidating my stake in Action Alerts PLUS holding Alphabet (GOOGL - Get Report) . Honeywell Gains on Thursday after J.P. Morgan Labels it "Top Pick"
The chart above shows that Micron's direction has changed dramatically this week. The stock's daily Moving Average Convergence/Divergence oscillator (MACD), Relative Strength Index (RSI) and Chaikin Money Flow (CMF) have all gone south. I currently own about 80% of my intended long position here, but I did add half of that this week, so I'm not feeling any pain yet. Micron closed at $44.65 Thursday, and my next spot to buy is $41. That's where I intend to add the last one-fifth to my intended size for this name. My own tolerance for the stock ends there. Sell Sept. 21 $41 puts, which closed Thursday at $0.98. Sell Sept. 21 $50 calls, which ended Thursday at $0.68. Making both of these sales will reduce my net basis for Micron by $1.66 a share. That's not too shabby. Yes, I might end up having to "eat" some MU stock at $41, but I'll have already reduced that net purchase price by more than 4% via the $1.66 that I'll have gotten from the above transactions. And yes, I might have to "take profits" on MU at $50 with the call option, but wouldn't that be nice? At the time of publication, Guilfoyle was long MU.